If you’re hunting for après-ski in the Ziller Valley then Mayrhofen is for you. Its location, in the glacial Zillertal range close to the Hintertux glacier which offers year-round skiing, is excellent, whether you like a long cruising run or an exciting fast drop. Plus it’s not lost its Tyrolean charms, the majority of the buildings are traditional and heavily-timbered - rustic even. 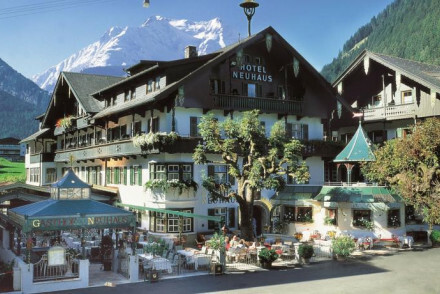 If you’re here for the après-ski then you’ll find the best places to stay in Mayrhofen in the town proper. But if you’re here to ski, or for the wonderful summer scene of hiking and gasthof-hopping, then you might find your idea of the best places just outside the resort, or tucked away in the surrounding hills. Mayrhofen is small enough so that you can walk everywhere and there’s a good ski bus service which will whisk you to other places within the Zillertal valley ski area. Mayrhofen’s ski area spreads out around the villages of Finkenberg, Lanersbach and Hippach and there are accommodation options in all of these towns, which are perfect if you’re looking for something a bit quieter. Maryhofen is also known for its spas and ‘wellness centres’, some are part of hotels, but there are some purpose built centres. 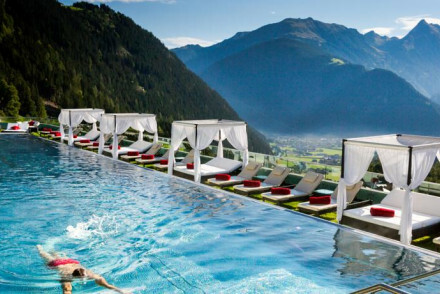 Mayrhofen is also a renowned wellness centre, a great place to relax after a long day on the slopes. Mayrhofen is the place to go in this ski region for apres ski fun! If you're planning to visit during the busy Christmas, New Year, Feb half term or the annual end of season Snowbomb Festival just be aware that the best places to stay in Mayrhofen will be exceptionally busy So either get very organised and book well ahead, or plan your trip for quieter times! The Elisabeth Hotel is an elegant, five-star hotel with 70 chic, Tyrolean style rooms. You’re just five minutes walk from the centre of town, plus there’s a wonderful restaurant and an impressive wine cellar. Adults only. Alpendomizil Neuhaus is a great central option for families. They have a range of accommodation from double rooms to family apartments and fantastic facillties including swimming pools (indoor and outdoor), spa, children's play area and restaurant. Just outside of Mayrhofen proper you’ll find the Sporthotel Stock, perfectly positioned for some of the best views in the whole of the scenic Ziller Valley. Expect all the comforts of a five star hotel, including an extensive spa menu and a spectacular pool and a cocktail bar with panoramic views. There are 108 rooms and suites with a romantic feel. Perfect for a romantic ski break? Hotel Kramerwirt is perfect for families with family rooms available. Being in the centre of town it is within walking distance to everything that one would need. The hotel is well decorated with contemporary wooden decor making it feel like a very alpine hotel! The best time of year to visit is between December and April, dependant on the year's snowfall, these months are normally the best time to visit. Superb alpine hotel set in the stunning Ziller Valley. The cosy, comfortable rooms afford excellent views out over the valley. In the winter, when not skiing, you can relax in the extensive spa; whilst in the summer months take walk on a Hintertux Glacier trail or simply relax by the pool. Active Holiday - Sking, Nordic walking, yoga and much more - there is an activity for everyone here! Skiing - Great skiing nearby and the hotel has ski storage and pass vendor facilities. 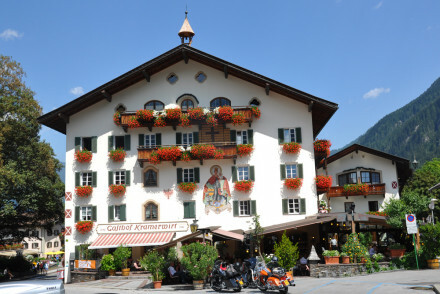 This traditionally Tyrolean hotel is located in the village of Mayrhofen. It features rooms and suites decorated in an Alpine style with plenty of wooden features. Be sure to relax in the rooftop hot tub after a day skiing and enjoy the splendid views all around! A family-friendly and cheery spot. A classy and elegant hotel offering five star luxury, in a central location. Chic and modern rooms, decorated in modern Tylorean style. 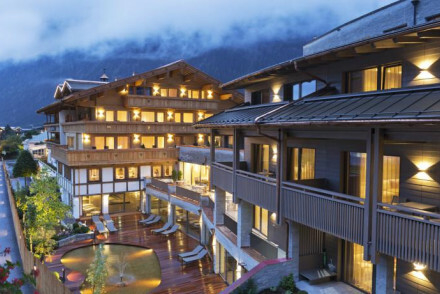 Excellent cuisine and an exquisite wine cellar along with a pool, spa, sauna and steam rooms make this adults-only hotel a top choice when in Mayrhofen. Local exploring - A five minute walk away from the centre of town, with easy access to the train station, slopes and hiking trails. Romantic Break - Comfortable and luxurious rooms with 5 star services, excellent views, massage and spa treatments and no kids! Sights nearby - Visit the interesting Schwaz silver mine, a compelling underground tour. A high class alpine hotel in the picturesque Ziller Valley. Host to all the creature comforts of a five star hotel, including an extensive spa and a fantastic panoramic cocktail bar. With great skiing on the doorstep, it's the perfect spot for a luxurious skiing holiday. Romantic Break - A perfect romantic, alpine getaway with spacious rooms and suites boasting incredible views, starry skies and king sized beds. Spa breaks - Spend a weekend relaxing in the hotel's extensive spa which focuses on hydrotherapy.